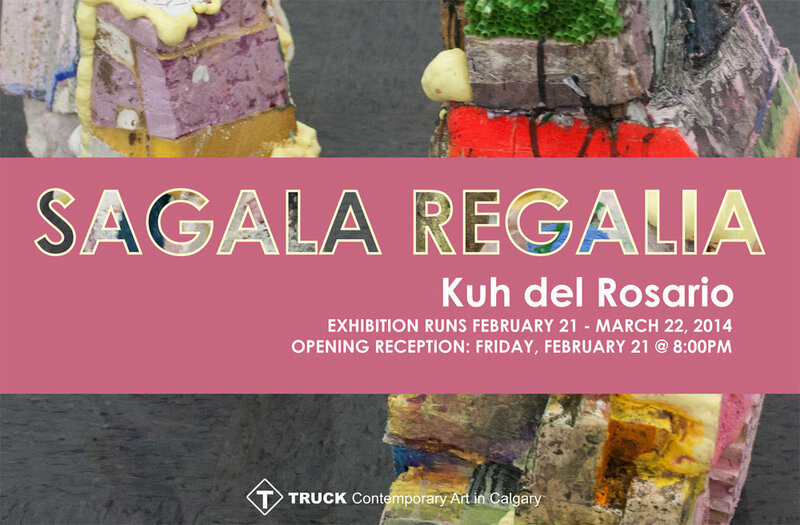 The term Sagala Regalia combines both Filipino and Latin words and translates to "Regal Procession," an apt title for Kuh Del Rosario's exhibition of sculptures at TRUCK. The term sagala refers to a religious-historical procession, during the Flores de Mayo festival held in the Philippines. (1) Participants or 'Muses' for the sagala are hand picked for their vitality and beauty. Adorned by a menagerie of colours, fabrics and seasonal flowers, the muses elicit inspiration and awe from the many onlookers and other participants of the sagala. The pageantry of the event eclipses the religious purpose of the parade, which is to celebrate Santo Nino (the infant Jesus), instead the procession and festival have become part of the Filipino traditions celebrating youth, love and romance; transformed beyond the intangible, spiritual origins and historical meanings of the festival. Having witnessed many of these sagalas in her early youth, Del Rosario pulls from her vivid memories to create a new procession of sculptures that seem to stand in for the muses that have reshaped the meaning of the event so poignantly. Del Rosario presents us with a procession of works that utilize materiality as a conduit for the transformation and celebration of meaning. Using salvaged materials and found objects harvested from TRUCK's throw away pile Del Rosario presents us with a pageant of a history of forms where meaning and materials are precariously reconfigured as 'interested simulacra' becoming a structural part of Del Rosario's sculptures. This approach to material and meaning is well grounded in modern sculptural practices as well, the French structuralist Roland Barthes had suggested that in place of "a [prevailing] mechanical=materialistic formalism," the exploration of an object's form is a theoretical act, rooted in its "materiality and functioning." (2) In his 2002 essay on Contemporary Sculpture and the Responsibility of Forms, New York based independent writer and curator Klaus Ottmann prescribes the concerns of contemporary sculpture as new variant of the materialistic formalism of Barthes - what he terms as 'spiritual materiality,' "one that is based in part on a structuralist analysis of the world that attributes ideological meaning to the materials themselves or inscribes linguistic codes onto them and in part on a participatory humanism - a renewed involvement in the question of being, transcendence, and the social by way of its materiality - a new variant...(3) This spiritual materialism includes art that either reconstructs 'material,' in a manner that is "reflexive or poetic, in such a way as to manifest thereby its rules or ideological structure." This transformation as a 'new variant' of materials is a vital part of Del Rosario's process, which involved the selection of materials culled from TRUCK's recent move out of our basement level gallery space in the Grain Exchange. Salvaged materials otherwise destined for the landfill became grist for the mill- "object[s] of the everyday...dredged up from the sediment of the urban quarry." Emerging from our subterranean vault were the material participants to the 17-year history of TRUCK's tenure in that underground venue. Del Rosario then employed an artistic process that favoured happenstance, mistakes, and corrections that cultivate an "organic development of the work." (4) A dialectical process that is as much a product of chance and circumstance, as a means of transforming materials, an imperfect solution to perfecting materiality and meaning. The resulting sculptures in Sagala Regalia are adorned with the remnants of our past; our precious exhibitions, events, correspondences, identity, layered under the weight of paint, foam, wood glue, and whatever medium the artist can summon. The artefacts and their histories are transformed through the power of the artist, as an agent of change, reconstructing and perhaps revealing an ideological structure that is at our very heart. This procession is then paraded before using a sovereign pageant of deepened meaning, vitality and beauty.